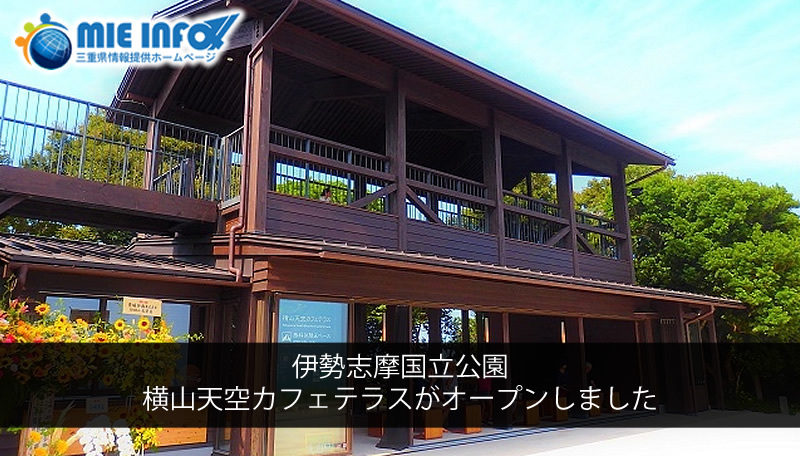 The Yokoyama Tenku Cafe Terrace in Ise Shima Kokuritsu Koen is now open! In Mie prefecture, we aim to brand Ise Shima National Park as a world-class ‘National Park’. The facility “Tenku Café Terrace” including the observation deck is located at Yokoyama Enchi (Yokoyama Tenbo-dai) in Shima City, which can overlook the Ago Wan known as the Rias Kaigan. It was renewed, and on August 5, 2018, there is a newly opened café in the facility. From the observation deck which was made from Hinoki, you can see the beautiful view of Ago Wan, the cafe ‘Mirador Shima’ sells sweets and various drinks made with Ise Shima’s ingredients. By all means, enjoy the majestic nature of Ise Shima Kokuritsu Koen and spend an extraordinary tea time that you can taste only at this destination.